Collectors always need to be careful when they're buying autographs. Sadly, the hobby has several people who knowingly defraud their customers by forging autographs of some of the biggest names in sports. PSA/DNA has released their latest list of the most forged sports autographs and it's filled with all-time greats and current stars. Leading the way, once again, is Babe Ruth. Authentic signatures from the influential slugger command huge money on the secondary market. And while he signed a lot of stuff while he was alive, an astounding number of forgeries have seeped onto the market over the years. In its report, PSA/DNA also points out that not all fake autographs were created with the intent to defraud people. One such instance is the use of secretaries and paid assistants over the years. 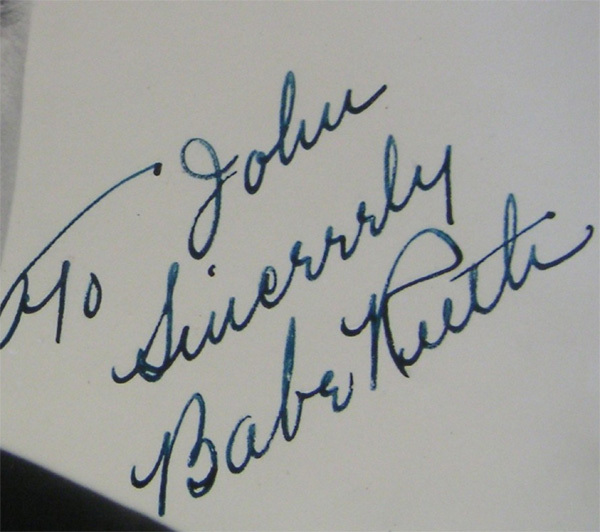 Many celebrities have used them over the years to respond to autograph requests through the mail. Whenever you're buying autographed sports memorabilia, it's essential to take precautions to avoid getting fooled. Authentic autographs can be worth hundreds, if not thousands, of dollars. Fake autographs are worthless. Start with buying from reputable dealers. Also, be very picky about letters of authenticity. If someone's going to forge a sports autograph, they're also likely to make their own letter of authenticity. Buy items that come authenticated from companies like PSA/DNA, JSA or Steiner -- companies with longstanding histories in the hobby. Another good rule to go by (but not foolproof) is that if something is too good to be true, it probably is. If someone is offering you an extremely cheap autograph, they could be out to make a quick buck. As always, be careful and look for warning flags. Here is the complete list of most dangerous sports autographs from PSA/DNA. Their ranking on the last list is also noted in parentheses. We have also noted PSA/DNA's value estimations for authentic autographs. The King of Swing is the most sought-after autograph in the hobby and the PSA/DNA rejection rate is extremely high. There is very high demand for the signature from the late Yankees hero and there's a large volume of forgeries. This time around, PSA has grouped three of baseball's biggest stars and prolific signers together. While there's no shortage of authentic autographs from any of the trio, they're popularity has led to a lot of fakes on the market as well. Despite signing thousands upon thousands of autographs while under contract with Upper Deck and Upper Deck Authenticated, the supply is not nearly enough to satisfy demand. Forgeries remain a major problem. What happens when a baseball rookie bursts onto the scene and promptly becomes one of its most talked-about stars? The forgers come out. It doesn't help much that Puig has a basic signature either. Even though Ali has been somewhat of a prolific signer in the past, the number of authentic Ali autographs fresh to the marketplace has decreased in recent years. Even though Tiger's popularity as an athlete and person has taken a serious hit in the last couple of years, he remains on the list of the most dangerous autographs. He has had a deal with Upper Deck for more than a decade. With the career accolades starting to pile up, there has been an increased interest in Derek Jeter autographs. As a result, the number of fakes has also increased. Wayne Gretzky is the greatest (and most popular) hockey player of all-time. Demand for his signature transcends the sport. When shopping for an autograph of the Great One, Upper Deck Authenticated items may be your safest bet as he's been with the company for a long time. King James has taken the reigns as the top basketball player in the world. Unfortunately, this has meant a growing number of fakes on the market. Like Jordan, Woods and Gretzky, LeBron James currently has an exclusive deal with Upper Deck. This is the safest place to look for real pieces. PSA/DNA also noted a high number of forgeries for Tom Brady and Lionel Messi. Zack Dickerson (ID 24640) � Zack, A great place to start would be to submit them to PSA/JSA or another well-regarded authenticator. If you live in a major city they may go to a local show or it can be done by mail as well. We have a Harlem Globetrotter’s admission ticket from the mid 1960’s signed by a Satchel Paige. As you know Paige played exhibition ball with the Trotters in the early 1950’s and again in the mid 1960’s. We are wondering what it might be worth. Is a MVP with a number and a certificate of authenticity real or traceable?